I'm starting my Monday as I mean to go on - full of healthy, clean, natural food choices wherever possible, plenty of water, not too much caffeine and a good long walk. After years of over-eating, and little exercise, I have learnt how amazing it feels in both body and mind when I nourish myself with good balanced, healthy food, and get plenty of exercise. These things are now part of my daily routine, and I don't feel like I have to work particularly hard anymore to ensure I'm leading a balanced life when it comes to my diet and the amount of exercise I do. In recent weeks I have been searching out new recipe ideas on my quest to put together a personal bible of 'clean eating' recipes I can rely on. Last week saw me try lots of new recipes from the likes of Deliciously Ella and The Kitchen Shed, all of which I thoroughly enjoyed. They were tasty, filling, vibrant and interesting meals - and most of them came in at under 600 calories. I always cook the same meal for both Liam and I, however, I tend to bulk his out by adding meat or extra carbohydrate or garlic bread etc - so that he can still eat a good hearty portion which will keep him full, and provide him with the extra calories he needs. I am very aware that I don't want to dictate what he eats too much and don't want to force a super-clean diet on him. I've said time and again that I do not consider myself to be a 'clean eater' 100% of the time, heck, probably not even 75% of the time. I eat processed food sometimes, I have the odd takeaway - and as you all know I'm rather partial to a piece of cake. However, where possible I try to make clean choices, and strike up a good balance between clean foods and the not-so-clean. 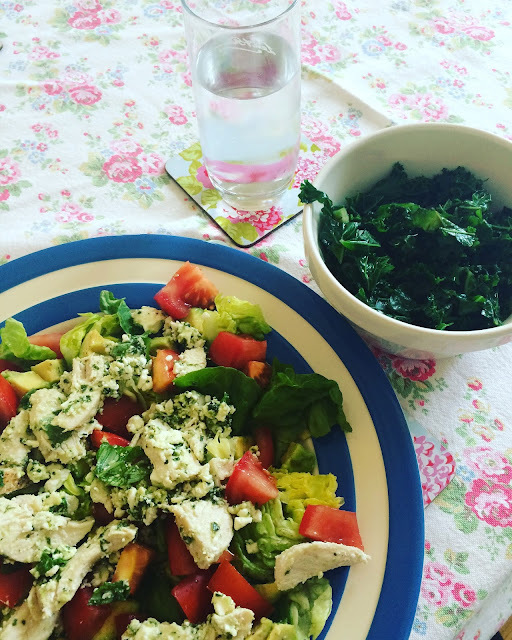 Today's lunch in at under 400 calories: a chicken, pesto, feta and avocado salad with lettuce and tomatoes plus a big bowl of steaming kale dressed with olive oil and lemon juice. So filling, full of goodness and totally clean and delicious. For me, leading a healthy lifestyle is all about organisation and planning (two of my favourite things, luckily). You won't be able to eat a good balanced diet without some planning and forethought. Each week I spend about an hour looking through recipe books and websites getting meal ideas for the week ahead. I plan seven meals (not necessarily on which day we are going to eat them) but I ensure we have seven balanced meals for the week - and then write my shopping list accordingly - checking the fridge/freezer/cupboards for what I already have, and what needs using up. This organisation means that a) we rarely waste any food at all and b) I don't go to the supermarket and wander aimlessly chucking random things in my trolley that may or may not make a meal. It means I am focussed, I spend less money on food and ultimately, we eat better as a family. -Organic peanut butter: it is so good for you, and is so filling and comforting. Great on rye bread for a speedy slow release breakfast, or even great for dipping fruit in as a snack. You can stuff medal dates with peanut butter and leave them in the fridge for a quick energy boost, and it is also used in many clean eating baking recipes. -Coconut oil: I'm planning a future post based solely on this amazing oil - but if you haven't come across it yet, then give it a go. It is so versatile - you can use it to cook anything you'd use olive oil for, it is great for dressings, perfect in clean baking, and even is an amazing moisturiser. -Fruit teas: If like me you could easily drink about 8 cups of tea a day, then a herbal alternative is well worth having in stock. I am now trying to limit myself to only 2-3 caffeinated teas per day maximum (which is a tiny amount for someone with a 5-6 a day habit) and so to replace my normal teas I have been trying lots of different herbal/fruit teas. They are cleansing and refreshing, but give the warmth and comfort of a normal tea. Try a few different ones to find your favourite brand/flavours, there are so many out there to try. -Wholewheat carbohydrates: Brown rice and pasta are infinitely better for you than their processed white cousins. They release energy slowly, keeping you feeling full up for longer, and ultimately preventing you from snacking on rubbish. I still weigh out my carbohydrates every time I cook as it is very easy to cook far too large a portion of carbohydrate - always follow the recommended portion size on the packet. 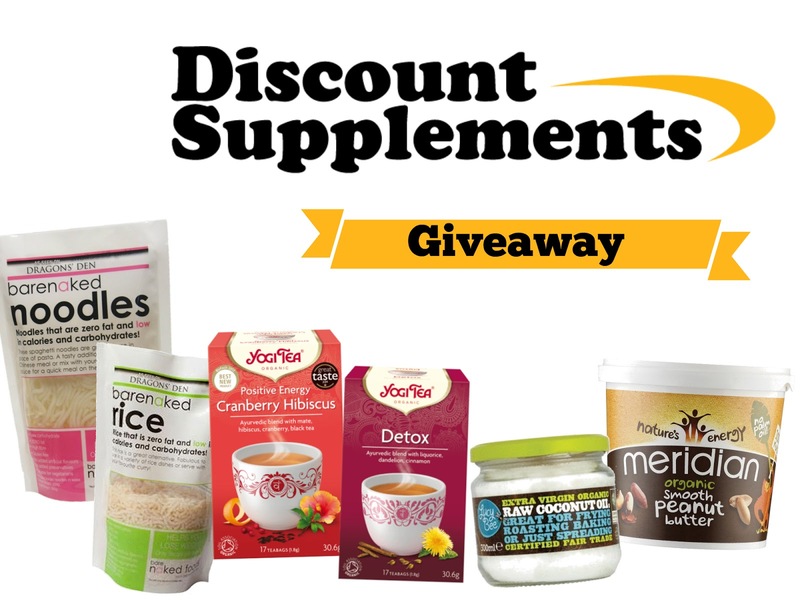 Right, to inspire you all on this bright sunny Monday I have a fabulous giveaway for you - you could win this awesome 'Health Conscious' food bundle from Discount Supplements worth £25, just enter via the Gleam App below..
Prize includes: Bare naked Rice, Bare Naked Noodles, Extra Virgin Coconut Oil, Yogi Detox Tea, Yogi Positive Energy Tea, Organic Smooth Peanut Butter. My courgette plant did really well this year so I sometimes make courgetti instead of having pasta, it's filling without being bloating and adds an extra portion of veg! I alway say it is best to eat in moderation and exercise. Have three meals a day an a healthy snack in between if necessary and opt for low fat, reduced ugar varieties. Not sure I'm the right person to give advice. Just it's not enough to read all the advice, you have to take it in and act on it. It's common sense really, don't overindulge too often. Stay away from the junk food isles at the stores. Don't eat anything your great grandmother recognize as food! If it has any ingredients you don't recognize, avoid it. Basically if it's not real food, don't eat it. Makes a world of difference, as many additives badly effect our health and weight to boot. Eat 5 portions of fresh fruit/vegetables daily! That way you'll maintain a healthy metabolism and also a good-looking skin. My top tip would be never to shop on an empty stomach as you're more likely to buy junk! Just eat real food & avoid processed rubbish! Eat a little of what you fancy. All those shouting "Moderation, moderation" have got it right but, remember, "in all things!" I try to make sure at least 60% of what is on my plate (or my kids plates) is fruit or vegetable. Cut the carbs and keep it mainly veg!